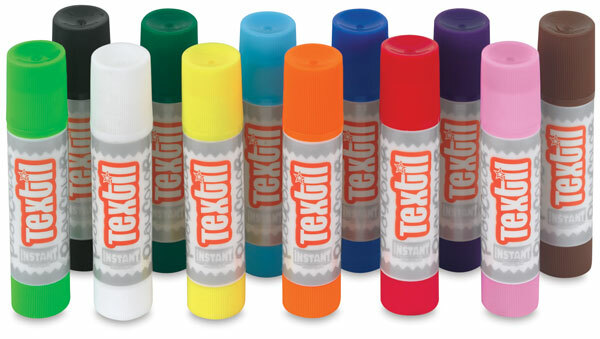 The no-mess, quick-drying, Playcolor kids love — now available in a permanent textile paint! Solvent-free, with no water, paintbrushes, or cups required, Playcolor Textil is designed especially for fabric painting. 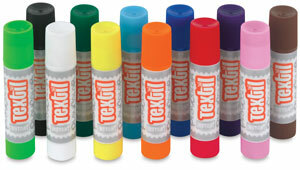 Great for artists of all ages, these bright, vibrant colors are simple to use. Just uncap, twist, and paint! Once dry, projects need only to be heat-set with an iron. Afterward, the colors are fixed, permanent, and machine washable. Set of 12 — This set includes White, Yellow, Red, Orange, Leaf Green, Dark Green, Sky Blue, Dark Blue, Purple, Pink, Black, and Brown. Set of 6 — This set includes Yellow, Green, Red, Blue, Purple, and Black.